They’re not rebuilding a mall. They’re creating a mini city. That’s a key message the team behind the Oakridge Centre redevelopment delivered at a media presentation previewing the project at Whistler’s Audain Art Museum Jan. 29. The Oakridge display was timed to coincide with the International Council of Shopping Centers convention held in Whistler Jan. 28 to 30. Oakridge Centre is the second-most productive shopping centre in Canada. It covers 28 acres, is on a main transit route and is designated a municipal town centre in Metro Vancouver’s Regional Growth Strategy. While rezoning was granted in 2014, progress was stalled for various reasons, including a change in ownership from Ivanhoe Cambridge to QuadReal in June 2017. QuadReal and Westbank are developing partners in the project. Henriquez Partners Architects is the design lead and Wonderwall out of Tokyo is designing the interior of the mall. The latest incarnation of the sprawling redevelopment, which conforms to the 2014 rezoning, includes 1,000,000 square feet of retail, 2,600 homes for 6,000 people, office space for 3,000 workers, a 100,000-square-foot community centre and daycare, the city’s second-largest library, a performing arts academy, a live music venue for 3,000 people and the largest public art program in Vancouver’s history, according to Remco Daal, president of Canadian Real Estate for QuadReal. It will also feature a nine-acre park, a one-kilometre running track and produce 68 per cent fewer greenhouse gas emissions than a comparable city of its scale. “The thing that makes Oakridge unique is its designation as a municipal town centre. The diversity of the uses include everything that a city has. It includes offices, housing, everything,” he said, while highlighting amenities such as the park, which weaves its way through three levels, the civic centre as well as the units of social and rental housing it’s delivering. Henriquez describes the overall concept as a new model for development, but says one thing it’s not is a mall. Westbank founder Ian Gillespie, who’s worked on previous projects with Henriquez such as the Woodward’s building, said the Oakridge project will create a “cultural hub,” which he sees as a way of city building. Using the analogy of a stool with four legs to describe what a city is, Gillespie called one leg the built environment or architecture and the other three legs the transportation, energy and cultural infrastructure. Oakridge, he said, brings all four legs together. Gillespie distances the project from other mall redevelopments that take advantage of a real estate opportunity — a mall with an empty parking lot that may have lost its anchor tenant — to add residential buildings. “What we have here is one of a handful of top shopping centres in North America and one of the really great residential opportunities in North America, and a couple billion dollars of transportation infrastructure, all coming together to create a really unique opportunity,” he said. “And then saying to ourselves, surely we can do better than just graft some residential on top of a shopping centre. That’s not moving the bar. That’s not creating a new typology. And that’s what I think we’re trying to do here. 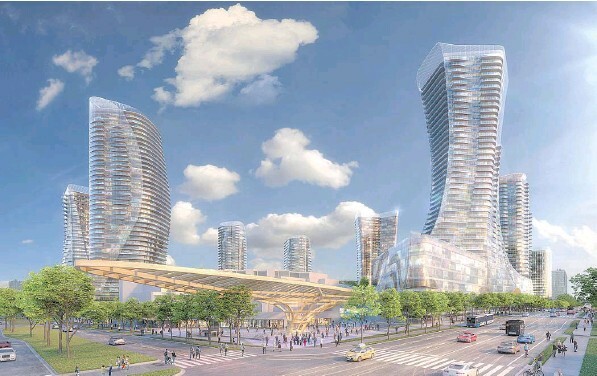 According to Gillespie, there will be “dozens and dozens of ways” the Oakridge project achieves this, but one of the ways is through Goh Ballet. The dance company is going to open a new practice at Oakridge that will triple the size of the school. He, too, said “it’ll be the biggest project I’ll ever work on.” The development team predicts it will draw more than 40 million visitors annually. The build-out will be phased and is expected to take six-and-a-half years to complete. The team anticipates delivering newly constructed retail and office space in early 2022. The first residences will be ready in late 2022 and it’s anticipated retail construction and the final residential building will be complete in 2025. Overall, more than 50 firms are involved in the project, including four architecture firms. Aside from Henriquez Partners Architects, they include Gensler out of Los Angeles, Adamson Associates out of Toronto and a landscape architecture team out of Vancouver’s PFS Studio. Like Henriquez and Gillespie, Daal of QuadReal considers the project a once-in-a-lifetime opportunity to city build. “It takes an army to pull something like this off,” Daal said, adding he hopes at completion people see it as “an exceptional cultural hub” and “a beautiful piece of public infrastructure” that features public amenities, homes, easy access to transit, as well as a place to shop and eat. In its latest data release, the Federal Reserve Bank of Dallas noted that Canadian real estate prices have shown its sharpest rate of decline in Q3 2017, a marked contrast to the situation just a few months ago when the Canadian housing market boasted of the fastest rising prices. The Dallas Fed data stated that Canadian real estate prices fell by 3.82% in the third quarter of last year, the largest single-quarter decline since the early 1990s and the first since 2012. This also marked the largest single-quarter decline in the world at the time. These developments might represent “the beginning of a broad market correction, like that seen in 1990,” as explained by Better Dwelling. However, the data emphasized that “despite the large quarterly decline, Canadian real estate prices are still much higher. The index is 7.44% higher than the same quarter last year, almost twice as much as the aggregate index for other countries,” Better Dwelling added. Perhaps the most important aspect to consider is that the decline occurred starting approximately 6 months before the OSFI’s revised mortgage rules were introduced in a bid to cool conventional mortgage borrowing. Metro Vancouver’s real estate market remains classified as highly vulnerable to volatility at the start of 2018 due to an overheating in condo sales in some corners and overvaluation of prices that continue to defy local fundamentals, the Canada Mortgage and Housing Corp. said Tuesday. That was the conclusion of CMHC’s first-quarter housing market analysis that found conditions in Metro Vancouver have remained in a precarious position for the last six quarters. And that segment, Bond said, is being driven by first-time buyers scrambling to purchase units where prices are still within reach of their means. For North Delta, buyers saw condo prices soar 53 per cent in the fourth-quarter compared with a year ago. In Surrey and Langley it was 34 per cent. More broadly, the scramble for more affordable housing saw prices in the Fraser Valley shoot up 15 per cent by the end of 2017, compared with the same period a year ago. By contrast, prices across the bulk of Metro Vancouver covered by the Real Estate Board of Greater Vancouver rose 10 per cent. CMHC’s forecast does anticipate new mortgage rules that make it tougher for first-time buyers to qualify for loans will curb some demand in the market. Bond said their forecast is for between 32,000 and 34,000 property sales in Metro Vancouver in 2018, compared with 37,000 in 2017, but a lack of inventory of homes for sale will continue to put pressure on prices in some segments. The region saw record-setting new-home construction in 2016, the CMHC’s analysis shows, but builders still haven’t been able to keep up with demand keeping the number of new units available for sale low. CMHC’s analysis also continued to track an issue with properties being over valued, prices that can’t be accounted for by local fundamentals such as income and population growth. On that point, Bond said the data CMHC has to work with “is a bit thin” to determine where the wealth to make purchases is coming from, but the agency is starting to build a better picture. © 2018 Postmedia Network Inc.
Westbank Corp. and QuadREAL on Monday unveiled a plan to transform the Oakridge Centre. Westbank Corp. and QuadREAL say their plan for the Oakridge Centre mall, seen in an artist?s rendering, includes creating community learning spaces. WEST BANK CORP. They hailed the vision as more than a revamped shopping centre with new residential towers. Instead, they said it will be a “cultural hub” at the corner of 41st Avenue and Cambie Street in Vancouver. “When you think of what makes a city, there is the built infrastructure — the architecture — then you have the transportation infrastructure, the energy infrastructure and the cultural infrastructure,” said Westbank founder Ian Gillespie at an event at Whistler’s Audain Art Museum. The massive Oakridge project is slated to unfold over 6 1/2 years with construction beginning in late 2018. The first office and residential towers lining the property’s perimeter will go up by late 2022. The retail facilities and remaining residential towers will be in place by 2025, according to Remco Daal, president, Canadian real estate, atQuadReal . In total, the plan has 290 affordable-housing units, 290 market rental ones and 2,000 condos. Westbank is also tapping architect and designer Masamichi Katayama of Tokyo-based firm Wonderwall Inc., which is known for its recent work on Japanese retailer Uniqlo’s flagship store on Fifth Avenue in New York. “Retail design is shifting from having a function of being a place to sell things to providing experiences that make consumers feel the DNA of the brand,” said Katayama. One of the first purpose-built rental properties to sell in a forward sale in Vancouver during the current surge in rental construction has come forward again. Mayfair Properties Ltd. is selling MC2, which it bought from Intracorp Projects Ltd. in 2013, before it was completed, for $26.8 million. The finished tower was listed in January for $54 million. The Goodman team at HQ Commercial Real Estate Services brokered the original sale of the 110-unit tower and is handling its latest listing. “It’s been a very successful project from a lease-up perspective,” Mark Goodman said when he acquired the listing in December. Goodman closed in January on the sale of another purpose-built rental tower, a 282-unit tower in New Westminster that sold for $90 million, or more than $319,000 per suite. The spectacular price increases would seem to encourage more developers to consider building rentals, rather than condos, as pure speculation, especially since most Metro municipalities will allow higher density for purpose-built projects than for starta buildings. But Goodman said Vancouver developers make more money on condominium projects, even when marketing and other costs are considered. According the Urban Development Institute, new Vancouver condominium prices now average more than $1,200 per square foot, which translates into a 500 square-foot condo price of at least $600,000. As comparison, the average price for a Vancouver multi-family rental building in 2017 was $535,000 per door, according to preliminary year-end data from the Goodman Report. In MC2 case, the price penciled to $490,900 per rental suite. While a boon to developers, all this is not necessarily positive for renters, of course: vacancies in Vancouver rental apartments remain low despite new construction, and rents continue to increase. Average MC2 monthly rents run from $1,430 for studios and one-bedrooms to $2,338 for two-bedrooms. This compares with the city of Vancouver average, Canada Mortgage and Housing Corp. (CMHC) reports, of $1,388 a month for leased units and $1,547 a month for vacant and available units. Rents for units at MC2 listed with Airbnb Inc. are significantly higher than those in the rental market, beginning at $118 a night. The rental search engine PadMapper pegs the monthly rent at $3,403. Whether or not the rental is legal is another question, of course. Despite city efforts to bring units listed with Airbnb into compliance, the presence of such units creates headaches for landlords and strata property managers. To address the issue, Vancouver-based Bazinga Technologies Inc. hopes to announce a partnership with Airbnb this spring that will give strata corporations a better sense of what’s going in their buildings and even to reap a benefit from the presence of the units through a share of booking fees. The new tool will require a data-sharing agreement allowing Bazinga to access Airbnb’s data and share it with building owners, its raison d’être. Bazinga provides software that facilitates communications within strata corporations. Started in 2012, it went national in 2014 through a partnership with Toronto homebuilder Tridel Corp. It now works with 2,000 communities representing 130,000 units. A deal with Airbnb would be the latest expansion for Bazinga, which last summer began acquiring property managers to work directly with strata corporations. Bazinga acquired the property management arm of Peterson Group in April 2017, rebranding it Tribe. Tribe now manages 5,000 units in B.C. and is negotiating two more acquisitions that are scheduled to close in early 2018, boosting its units under management to more than 15,000. Vancouver closed 2017 with promises of great advancements in affordable housing, including rentals. Yet as the year closed, starts lagged behind 2016 by nearly half. CMHC figures indicate 1,717 rental starts in the city of Vancouver in 2017’s first 11 months, down from 3,245 in all of 2016. Hardest hit were non-market units, with just 31 units started versus 414 in 2016. Regionally, 4,328 rental units were launched across Metro Vancouver in 2017’s first 11 months, down from 6,841 in all of 2016. Of these, 266 were non-market units – about half the 2016 tally of 536. In comparison, 21,090 new Metro Vancouver strata housing units had been registered in 2017 with BC Housing, all of which will likely start this year. While the Bank of Canada’s latest increase in its overnight interest rate was a move marked with characteristic caution, a combination of existing factors means that the hike will still make significant waves in the nation’s economic engine, according to Dr. Sherry Cooper of the Dominion Lending Centres. The BoC’s decision to increase the rate to 1.25%, which marked the third hike since July 2017, pushed the figure to its highest level since the global financial crisis, Cooper said. “The move comes in the wake of unexpected labour market tightening and strong business confidence and investment. The Canadian economy is bumping up against capacity constraints as the jobless rate has fallen to its lowest level in more than 40 years,” Cooper explained in a recent posting. Cooper cautioned that consumption and housing will slow as a result of the combination of higher interest rates and new mortgage guidelines. “Growth of household credit has slowed somewhat since the first half of 2017, even though some households may have pulled forward borrowing in anticipation of the new B-20 guidelines related to mortgage underwriting from the Office of the Superintendent of Financial Institutions (OSFI). This slowing is consistent with higher borrowing costs due to the two policy rate increases in 2017,” Cooper quoted last week’s Monetary Policy Report (MPR) as saying. “Elevated levels of household debt are likely to amplify the impact of higher interest rates on consumption, since increased debt-service costs are more likely to constrain some borrowers, forcing them to moderate their expenditures,” the MPR went on to say. While some industries are slow to change and reflect predominant social mores, the real estate industry is not one of them. On the consumer side, there are more single women buying homes than ever before, but the shift is also apparent among the ranks of real estate professionals. According to Liza Rogers, founder of the Women’s Real Estate Network (WREN), women are having an obvious influence on the design and production of homes. Rogers started WREN about two years ago because she noticed women were unmistakably changing the real estate industry but had few resources and networks at their disposal. WREN’s objectives are to empower women to both invest in real estate and manage their holdings. Another one of the organization’s purposes is to instill the virtues of building responsibly, and WREN will be discussing all of those things and more at the Victoria Real Estate Investment Expo on March 3. Cheri Crause, a sales agent with Royal LePage Coast Capital Realty in Victoria, can attest to the transformative impact women are having on the real estate industry. An agent for 11 years, Crause has been a real estate investor since 1997 and says the evolution she’s witnessed is unambiguous. As society becomes more egalitarian and women are no longer deprived of options, but rather encouraged to exercise self-determination, real estate has become one of their most preferred industries. One reason, believes Crause, is women are more visual, and like Rogers, she sees it in the ways homes are designed. “It’s the height of the cabinets, the height of the counters, the practical layout,” she said. Crause is also a builder—a natural step for a person who has been living and breathing real estate for more than two decades—and she expects more women in real estate to follow a similar path. Developer: Polygon Bristol Heights Homes Ltd. Architect: Raymond Letkeman Architects, Inc. Interior designer: Polygon Interior Design Ltd. When you buy a home in a brand new, purpose-built development, it can sometimes take a while for a sense of community to develop – for people to meet the neighbours, to get to know each other and to make new friendships. But at Polygon’s new Bristol Heights development in Abbotsford, that community spirit is already in place. Bristol Heights, a collection of 195 two- and three-bedroom homes, is the fifth and final townhome development at Polygon’s master-planned Westerleigh community. The development is amenity rich, and includes a 9,000-square-foot clubhouse called Club West, which includes an outdoor pool, a whirlpool spa, a fitness centre, a firepit, a barbecue area, an outdoor fireplace, a hockey room, a fireside lounge, a billiard room and a movie-screening room. For Lindsay Westerink, that sense of community is important. She has bought a three-bedroom townhome at Bristol Heights with her husband and is looking forward to moving in later this year. The shopping centre Westerink mentioned features outlets such as Marshalls, H&M, Urban Barn, Sephora, Forever 21, Walmart and London Drugs. Other local amenities include Rick Hansen secondary school, Harry Sayers elementary, a Cineplex Odeon, Fraserglen Golf Course, an ice arena, an indoor pool, squash and badminton courts, and much more in the way of parks, museums, farms and wineries. Alam said that compared to many offerings in the rest of the Lower Mainland, the townhomes at Bristol Heights are more affordable and buyers are getting more space for their money. Many of those buyers are from Abbotsford, according to Alam, although Polygon has also been getting plenty of interest from residents in places like Langley, Surrey and Delta. As for the homes themselves, there’s contemporary farmhouse architecture by Raymond Letkeman Architects, as well as decks, patios and fully fenced yards. All homes have attached, two-car garages and privacy screens between patios and decks. Polygon looks after its own interior design and at Bristol Heights the kitchens feature flat-panel laminate cabinetry in white gloss and grey cedar with polished chrome pulls. The stainless-steel appliance packages include 18-cubic-foot, auto defrost, top-mounted refrigerators, 24-inch-wide stainless-steel dishwashers, 30-inch-wide slide-in four-burner electric ranges and 30-inch-wide two-speed hood fans. There are polished engineered stone countertops and full-height ceramic tile backsplashes, entertainment-sized kitchen islands, rotating corner cupboards and roll-out recycling stations. Bathrooms have full-height vanity mirrors with engineered stone countertops and dual porcelain sinks. The showers feature glass doors, shower heads with wands and bench seating. Main bathrooms include bathtubs with ceramic tile surrounds, porcelain sinks and vanity light bars. You’ll also find porcelain tile flooring and flat-panel cabinetry in white gloss or grey cedar with polished chrome pulls. All bathrooms feature dual-flush toilets. Custom choices at Bristol Heights include stacking or side-by-side washers and dryers (depending on the plan) and microwaves with designer trim kits. You can also upgrade to a counter-depth Fisher & Paykel stainless steel fridge with bottom-mount freezer. The homes at Bristol Heights range in size from 1,250 to 2,200 square feet and prices start in the mid-$400,000 range. After reading your column last week about collections, our council requested a copy of our current receivables from our property manager. We were horrified when we went through the list to discover we have no backup decisions, minutes, support or knowledge of a number of debts outstanding that date back to early 2015. We have shown a number of annual budget surpluses for 2015 and 2016, but if we can’t recover these debts, we will have to write these debts off and our owners will be left with a deficit that we have to pay back. Not good at a time when our fees are rising faster than the rate of inflation. Our question: Can we still collect an insurance deductible from 2015 for $10,000 if the strata has done nothing about it? We scoured our minutes for 2015 and there was no indication the council took any action and this owner has now their unit listed for sale. So how do we collect this? Wow! Last week’s column opened the flood gates with over 500 emails from council members in a similar situation. The general response is that councils are not getting monthly reports showing detailed receivables and as a result, have no way of enforcing bylaws and making collections’ decisions. A late payment of a strata fee, for example, is a bylaw-enforcement matter and a penalty cannot be automatically added to the account unless the strata council has followed proper bylaw-enforcement procedures. A collection of an insurance deductible cannot be imposed on the issuing of a Form F Payment Certificate required when someone sells their strata lot, unless the strata corporation has a decision from the courts, the Civil Resolution Tribunal or an arbitration, or has an accepted action in those jurisdictions. This would either require the seller to pay the debt, a written undertaking from their lawyer agreeing to pay the debt on conveyance, or that they pay the amount into trust to the strata corporation to dispute the amount. If your strata has done nothing to collect the $10,000, the two-year limitation period on collections and actions may have expired at this time and it may now sadly be unrecoverable. Before you make that decision, place a call to your lawyer to determine if you have any options. If the owner has acknowledged the debt, that may continue the two-year limitation period. The best solution for strata councils is record all bylaw-enforcement decisions in your minutes. If any fines or penalties or enforcement actions are authorized, record the details as well. Without this information, future strata councils have little information to rely upon as strata councils and managers change frequently. If the strata council voted on bylaw enforcement and collections decisions, why is that information not in the minutes? Bylaw enforcement and collections are not private or confidential information. Do not include any personal information of owners, tenants or occupants, but the decisions are critical. It is the only method to track and follow up on decision-making. Here is a simple, yet effective, example for minutes that identifies the decision, what strata lot it affected, the action of council, and any ongoing instructions for the strata manager. If your strata council and manager manage action-type minutes that carry over until a matter is resolved, your monthly business will be much easier to handle and you will avoid needless losses and disasters. You are currently browsing the Les Twarog Vancouver Real Estate and Condo Blog blog archives for January, 2018.